Straight out of a crappy B-movie like Final Destination 19: The Windy City, a few hapless tourists got an injection of nightmare fuel on Wednesday when the glass appeared to crack in the 103rd-floor observation deck at Chicago's Willis Tower. But unlike said cinematic schlock, the tourists survived and didn't land on top of a moving bus or another character. 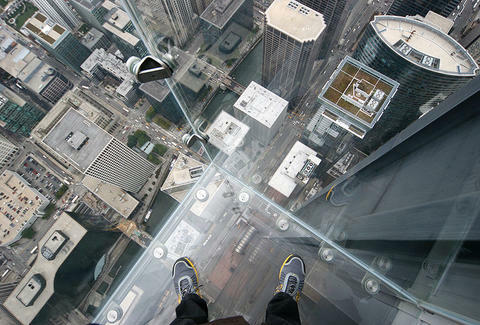 NBC Chicago reports Alejandro Garibay and several family members were in the glass case, called The Ledge, that protrudes four feet from the west side of the 108-story Midwestern phallus, when they said they heard a cracking sound. Garibay told NBC Chicago that staff quickly had his group shuffle away from the nightmare box, but that "They jokingly and confidently responded, 'It's unbreakable'", so the tourists snapped a few photos and moved on. A spokesman for Willis Tower said Thursday it wasn't actually the glass that cracked, but rather a protective coating covering the glass. Apparently engineers are now developing protective coatings to scare the piss out of everyone. The Ledge opened in 2009, and constitutes four glass cases composed of 1.5in-thick glass that protrude 4.3 feet beyond the building. And now, it also will justify the fears of every person who has ever been afraid of heights. Ryan Craggs is Thrillist's Travel Editor. He doesn't fear heights, but does fear poorly designed support structures. Follow him @ryanrcraggs.